Very cold but snow almost gone, sun quite warm out of icy wind. Rene did not come yest. but Jean went to see her. She sent cakes and “Village Memories” of Mr Middleton of Radio gardening fame. Tom had changed my library book at Boots’ for me. Jean went to Chapel this morning, was late for dinner. I gather she and David and Ken exchanged a few compliments re B.B. [Boys’ Brigade] and G.L.B. [Girls’ Life Brigade]. She did not get to Sunday School as she had a lot of home-work to do. It is a bug-bear this homework. Rene came this afternoon and had a cup of tea. Father is on watch at 8.p.m so shall soon have to get his supper. 10.PM. Father had his supper and went on watch at 8 o’ c. This new time arrangement mixes one up. He came off at 8 am, went on at 8 p.m tonight, off at 2 a.m and on again at 12 to 6 p.m to-morrow. I have written to Ron and to Jock. Kettle is nearly boiling for bottles and it is time Jean was in bed. She has washed her hair and set waves with grips. I gave Mrs Hutton her [Jean’s] old house shoes on Fri. She seemed very grateful and said she would give me one or two coupons for them. One has to be very careful in giving things away as people’s pride is easily hurt, but in these days we can always make the shortage of coupons the excuse for passing things on and most people are glad of them. (Glad of them must be a Lincs expression. I’m sure it is not grammatical.) We have had no letter from Ron for a week, hope there is one tomorrow. Chas. Parrish is on leave, Mr P. thinks his Regt. is going abroad as he has 16 days. Expect they will feel it a lot, as he is only boy and not too strong, also both girls are away now. He can hardly be 20 yet I think. Finns have not come to a decision yet. Bulgars feeling for peace but immense difficulties in the way. Mrs Hutton, here, was probably of the family which had been evacuated from Grimsby, at first to Hogsthorpe, and at that time believed to be living almost next door, in ‘Red Tiles’ no longer used by the Army (see 11 Apr 1941). A bright cold morning, hardly daylight yet. We don’t take down black-out until 8.30. now. We could do with the extra hour in the morning now. I always think it would be nice to have normal time for the winter months. Most people have to be about by 7.a.m. so it’s no saving of light to have the extra hour in the evening. Yesterday morning, 12 a.m. Nov. 23-24 midnight a Lancaster plane returning from bombing Berlin crashed on the beach near “Alongshore”. The altimeter wasn’t working and they thought they were 2,000 or more feet up when they hit the sea and rebounded to the beach. Father was called up as were all C.G.s and they went to see what could be done. As they did not know at W.Bx (it being dark) whether it was on land or sea they called out Lifeboat Sk[egness] which was on sea in 15 mins. Smart work. The ambulance from R.Art. on the contrary was over 1 hour before it arrived and the poor fellows, 3 badly hurt, had to lay there waiting. It was afterwards found that 2 more were pretty badly hurt too, one of them walked to W Bx to phone his base and did not know he was hurt until taking off his helmet as he was sweating, he borrowed Father’s handkerchief (it would be his oldest coloured rag tho’ clean) and wiping his forehead found it covered with blood. Even then he thought it was not much. Two men are dangerously ill. Father waited for Amb[ulance] and took it down to “Stokeby” to get as near as poss. Then they carried the men on stretchers. One of their own crew helped carry one, and Father said when they put him down, he was one of the badly hurt tho’ not complaining, he gently stroked the poor fellow’s face and hair and said affectionately, “Never thought you were as heavy as that, you old D—-”. Expressive of his feelings if not elegant. The men on watch P[aul] and Par[ish] sent them their flasks of tea. It is strange that we did not hear it but were fast asleep when M[addison] knocked. Rene said it rocked their bungalow. I was awake not long before and wished they would not fly quite so low but the very low-flying one crashed too we hear a few miles inland. Hard luck to win home so nearly and then crash. Father went to Sk yest. morning and brought the clothes home Rene had washed and got dry. She came same time as she had to put them out again to finish drying, so waited to get them in and hers too. Had letter from Em L with photo of Kath’s baby a fine boy, John David. Must return it. Also a letter from Jock’s wife and I had sent G[reetings] A. Graph the day before. His address is slightly different but still in Africa. He had been in hospital but had not told her what for. Says she is very fit and well, evidently Land Army life suits her. The crash was observed by Frank Raynor, on duty at the ROC observation post, who was first to reach the aircraft, on bicycle, followed by Joe Kirk, on coastguard duty at the watchbox, whom he had alerted on the way. The crew members were all in shock, having evacuated the plane, and one asked Frank to retrieve a white glove, a present from a girlfriend. All survived and resumed flying within six months. Alongshore’ was a bungalow on the seashore-edge of ‘The Marsh’ almost opposite Granthams’ farm (see Village Map). (Account related by Ken Raynor). Further details, including names of crew members, are given in the Crash Logs (1943) of ‘Bomber County Aviation Resource’ website. The ambulance was most likely from ‘HMS Royal Arthur’ (not Artillery). 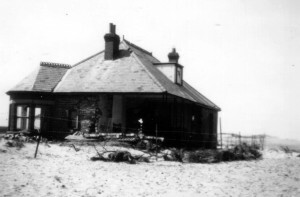 ‘Stokeby’ was a house between ‘Alongshore’ and Wolla Bank (coastal strip further north towards Anderby). John David was the baby son of Kathie, née Lewis, one of May’s sister Emily’s daughters (see 15 Feb 1943).